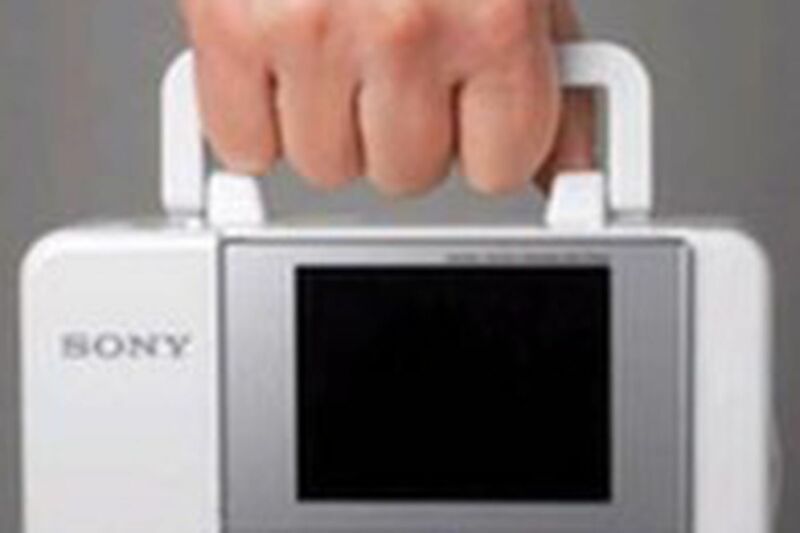 THE GIZMO: Hot stuff from Sony. While most manufacturers unfurl their best and brightest new items at the Consumer Electronics Show, Sony holds back some of its niftiest inventions for its dealer line show. Here's what the insiders are discovering this week in Las Vegas. This year, the company is giving a big boost to the cause of Bluetooth-enabled devices that communicate wirelessly with each other. Even when located in another room or outdoors, new Sony micro-component sound systems ($150-$300), boomboxes (the ZS-BT1, $150) and even home theater systems ($300-$500) will be ready to play the music you've cued up elsewhere - on select Network Walkman music players, Sony Ericsson mobile phones and Vaio computers equipped with Bluetooth radio signal transmitters/receivers. The company also is introducing its second Bluetooth-ready car stereo with a built-in microphone, the MEX-BT2500 ($180, available this month), especially good for hands-free phone blabbing in transit, and the first Bluetooth-enabled wireless headphones (around $100). Oh, and most of these products will also work with rival brands' goods if fitted with a Sony-made adaptor ($50-$100) or engineered to the stereo Bluetooth AA2DP (Advanced Audio Distribution Profile) standard. MORE INTEGRATED SOLUTIONS: Confused by all the switching options on your multi-component home theater system? Sony has a solution for that, too, a new product feature called "Theater Sync." Fire up, say, Sony's second-generation and more affordable BDP-S300 Blu-ray Disc Player ($599, available this summer). It will automatically send cues down an HDMI cable to turn on and tune one of Sony's new A/V receivers and/or Bravia TV sets to the proper input and best picture and sound selections. Watching home system-sourced TV programs from a distant location will be more inviting on the summer line of Sony's VAIO notebook computers. That's cause these PCs ($1,000 and up) will come pre-installed with LocationFree software that works with (you guessed it) one of Sony's LocationFree Base Stations, selling for $200-$250. The base device beams a remotely selected TV channel or pre-recorded show over the Internet. It also works with Sony's PSP (PlayStation Portable) and with just about any other Internet-connected, Windows-based laptop or Apple Macbook with added software. PICTURE PERFECT: Almost any "PictBridge enabled" digital still camera can connect to Sony's new and feature-rich Picture Station photo printers - the $200 DPP-FP90 (with 3.6-inch LCD screen) and $150 DPP-FP70 (with 2.5-inch viewing screen) - to make fine, 4-by-6-inch prints. Tap the Auto-Touch-up button and the printer not only corrects the exposure but also sharpens an out-of-focus image, eliminating the visual echoes created by camera shake. Also nifty are printing filter modes that pull off stunts like highlighting the subject in full color while washing out surrounding stuff. If you do connect a Picture Station to a Sony brand Cyber-Shot or Alpha D-SLR, you get bonus points. The printer now accesses stored setting information to optimize the results. And there's yet another reason to buy a new Cyber-Shot like the ultra-compact DSC-H9 ($480) and DSC-H7 ($400), coming in April. Both feature a high-definition component output so shooters can share their best images on any big-screen HD TV that's connected with a $40 accessory cable. SQUEEZE PLAY: One of the biggest impediments to buying a new, larger-screen HDTV is logistical. "People are reluctant to toss out the fancy cabinet that they bought or built-in in for their last TV," noted Sony exec Randy Waynick. To the rescue comes the KDF-37H1000, a 37-inch, high-definition (1280x720p) display that slips into the same cabinet opening as one of Sony's old-line, 32-inch TV sets. To make the install simpler, this new, $1,300 rear-projection set (utilizing 3LCD microdisplay technology) is much thinner and weighs just 57 pounds. And like the majority of other new Sony TVs, this model supports the brand's new BRAVIA Internet Video Link module ($300, available July). Snap the little box onto the back of the set, make a simple Ethernet connection to your home network and voila! You'll now have direct access to free Internet video programming on the big screen, including high-definition content, from partner providers AOL, Yahoo! and Grouper, as well as Sony Pictures Entertainment and Sony BMG Music. BLAH, BLAH, BLAH: As someone who often transcribes lengthy interviews, I'm coveting Sony's top-of-the-line digital voice recorder, the ICD-SX57DR9 ($250, spring). It's slim, sturdy and loaded with features, including a new, high-quality STHQ mode good enough for capturing music and making podcasts. But what really got me is this recorder's compatibility and bundling with Dragon Naturally Speaking speech recognition software from Nuance Communications. Plug the voice recorder into your PC and the software converts voice to text, even inserting commas and periods where needed and eliminating unnecessary "ums" and "ahs."